The Best Books Ever: Gathering Frost by Kaitlyn Davis ~ Jaime's Blog Tour Review ~ Giveaway! Gathering Frost by Kaitlyn Davis ~ Jaime's Blog Tour Review ~ Giveaway! I just want to say, before I even get to the review, that you can get this absolutely awesome book from Amazon for under $3! I would recommend it wholeheartedly! Jade is the only female member of the Queen's Guard. She walks the wall, always alone, always apart from the other guard members. And that is what she prefers. She has just been summoned by the Commander one evening, to be told the Queen requests a meeting with her, when an explosion rips through the night. Thinking it is the rebels, Jade takes off against command. There, she finds the Queens son, Asher, who escaped many years ago. There is a bounty on his head, and Jade is ready to bring him in. While they are fighting, a sinkhole opens, and Asher saves Jades life. She allows him to go free, and this decision will ultimately change her life in more ways than she could have imagined! Jade is a fascinating character. In the beginning, she is under the Queen's thrall. The Queen takes the emotions, the feelings, from the people of her Kingdom. It leaves them as shells, only ever feeling cold and empty. Heartless. That is how we first get to know Jade, but there is something different about her. Something that made me root for her, even then. And throughout the story, she becomes such a fierce, wonderful MC. She was relate-able, and watching her grow, and change, was one of the greatest parts of the book. Asher was the sweetest! There were very few moments when he wasn't smiling, and even when Jade was fully under the Queen's thrall, he treated her like she was someone worthy of kindness and respect. Even when Jade should have been treated like a prisoner, he came to her every day, with games to play. And he brought her books! To me, their romance grew at a great pace, and I thoroughly enjoyed watching the progression from enemies, to friends, to something so much more. The romance is the other greatest part of this book! One more character that I have to mention is Maddy. I ADORED Maddy. She was goofy, energetic, and talked all of the time, but she was a huge part of Jade becoming the wonderful character she became in the end. I loved her to pieces, and hope we get to see more of her in the books ahead! 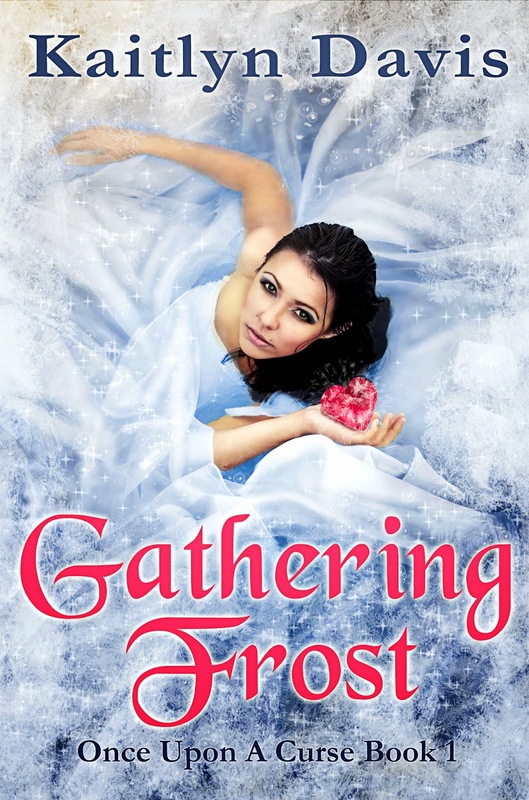 Gathering Frost is a very loose retelling of Sleeping Beauty; instead of a beautiful girl cursed with sleep, a town is cursed with coldness, emptiness. The journey to wake up the town, to save the people, and reunite loved ones, was a fast-paced, fun, heartwarming adventure. I truly enjoyed every minute of this story. The ending leaves you with just a hint of what happens with Jade and Asher in the next book... Which might just be a retelling of a certain Beast and his Beauty! If you love fairytale's and their retellings, and stories with great characters, romance and adventure, Gathering Frost might just be a great book for you! I know that I enjoyed it, and I have a feeling there will be many more readers falling in love with Jade and Asher in the months and years to come! Thank you to YA Bound Book Tours, and the wonderful Kaitlyn Davis, for allowing me to read this book, and share it with my blog! I've always been a writer. I grew up duct taping my novels together, started writing complete manuscripts in high school and studied creative writing at Johns Hopkins University. Upon graduating, I decided it was finally time to actually give my dream career a chance. So, of course, I started writing a young adult paranormal romance series -- and no, I'm not jumping on the bandwagon. I've been a true paranormal supporter for my entire life! I blame my obsession almost completely on Buffy the Vampire Slayer, my all-time favorite television show. And, before you ask: Yes, I own every season... even the post WB ones! I especially challenge anyone to watch the first three seasons and not fall in love with Angel, securing a lifelong love of vampires! Other culprits of my paranormal obsession are some of my favorite authors: JK Rowling, Raymond Feist, Meg Cabot, Richelle Mead, Lynne Ewing and Tamora Pierce. I haven't heard of this book before now, but it looks like I need to check it out! Great review! You should absolutely give it a shot! Thank you so much for your comment! It made my day. I truly adored this story, and I am very much looking forward to what comes next!